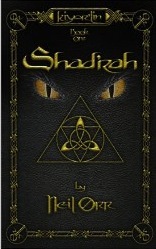 I recently had the pleasure of reading Shad’rah – Book One of the Kiyor’lin Series by author Neil Orr. The book falls solidly within the fantasy genre but while brining some familiar character personalities that are part of any good fantasy troupe, it does bring to the table new takes on old fantasy stereotypes. The land of Kiyor’lin is full of fresh fantasy faces, from dwarves who historically didn’t really get along with anyone, elves who with time have gotten over their superiority complex, humans who “arrived” in the land a few generations ago from another world, to a society where the different races and species rarely let their differences fly in the face of their mission. Orr even turns the comfortable genre on its head by replacing the typical, strong, battle-worn protagonist with a young elf king who has to date refused to accept his place in life. And through the course of the adventure, grows into his own, becoming who his team and his kingdom needs him to be. Like any good adventure, there is evil that has risen again and now threatens all of the kingdoms in the land of Kiyor’lin. While the ultimate battle and defeat will not be realized in Book I, there is plenty of action and violence to keep the Conan’s of us satisfied, and leaves you with the desire to pickup and read the next book.